[The race riots of 2005 in France were] an aspiration to equality. The ethnically-mixed youth of Seine-Saint-Denis are in the tradition of social upheaval which punctuates the history of France. I was sure that Nicolas Sarkozy, responsible for the outbreak of violence in the banlieues [referring to the 2005 race riots across France], would suffer as Minister of the Interior. These riots had rather filled me with hope . . . In fact, they marked the beginning of when politicians and ideologues would be rewarded for attacking the banlieue and youths [i.e. for race-baiting]. The fundamental effect of these events was to tense up older voters. French society turned into a mass gerontocracy. Some wanted to see ethnic problems in what was in fact a conflict between older and younger people. The violence of 2005 marks the failed rebellion of the youth and the success of Nicolas Sarkozy, the elected official most supported by the elderly in the entire history of the right: 44 percent of over-65s voted for him in 2007. Sexagenarians are criticizing young people for being Arabs, Muslims, or rappers, as they criticized the children of the 60s for having long hair and liking Anglo-American pop. What these people reject is the very idea of a new France. The problem will not be resolved through a violent ideological struggle. The solution is demographic: We are old hegemons, but we will disappear. One can always find reasons in oneself to reject the passage of time and the replacement of generations. The real “grand remplacement” [great displacement]. This passage, I suggest, is the most egregious kind of falsehood or the most deceitful kind of lie; for it is littered with often perceptive half-truths, while ultimately being completely misleading. The race riots and “carbecue festivals” committed by Muslim and Black youths are perfectly French (“are in the tradition of social upheaval which punctuates the history of France,” no different to intergenerational conflict in the 60s) and are socially progressive (“an aspiration to equality” which “had rather filled me with hope”). Todd accurately notes that Sarkozy was (and still is) a race-baiter, getting votes by appealing to White ethnocentrism (though, we might add, he does not actually defend indigenous European interests, for immigration continued unabated under his reign). Todd also accurately notes that France is a kind of middle-aged “mass gerontocracy” (the average voter’s age is 50). Indeed, I would add that the public in France could be deemed conservative, frightened, semi-senile: Most cling to their steady, semi-bureaucratized job and welfare, not caring about the mass unemployment of the youth or the fatal legacy of an Afro-Islamized France they are bestowing upon their children and grandchildren. There are no ethnic problems in France! Rather this is merely an optical illusion single-handedly created by Sarkozy and the prejudices of stuffy old Frenchmen who refuse to be physically replaced (“these people reject the very idea of a new France”). Finally, Todd seems to insinuate there is no “great displacement” of significant ethnic demographic change underway, moments after acknowledging that “a new France” is actually emerging. Todd is a demographer by profession and is more than intelligent enough to know these are falsehoods. He knows that there are no harmonious and egalitarian multi-ethnic societies. He knows that the Grand Remplacement is indeed happening, for we know that Whites will be a minority in the United States by 2043, in Great Britain by 2066, and no doubt in France shortly thereafter (already Afro-Muslims are estimated to make up about a third of births in France). Like Paul Krugman, Todd makes the perfidious and ultimately genocidal argument that ethnic tensions will disappear when the relatively ethnocentric generation of older Whites dies off and is replaced by “people of color.” In fact, racial polarization has steadily increased as Whites shrink as a share of population, and everything suggests this will continue as they become a minority. As Black/Hispanic violence in America and Jewish/Muslim violence in France show, Whites are not the ultimate cause of ethnic conflict, which is ultimately ethnic diversity itself. One could also cite all the multi-ethnic countries in the world in which Whites are absent and which all have varying degrees of ethnic tension and outright violent conflict. I will provide a little context on Todd to better elucidate where he is coming from. Todd is not a marginal figure but a pundit frequently invited on French TV shows to argue a strange brand of anti-Eurozone and pro-immigration civic nationalism, all the while railing against the French Establishment. He first came to prominence in the 1970s for predicting the collapse of the Soviet Union, citing demographic factors. Todd has also attracted some attention for his powerful theory of family structures, which he uses as a basis for rehabilitating the concept of national character (in short, that a nation’s values in the modern age will reflect the unconscious norms of its premodern family structures). But he does so while explicitly rejecting race and ethnicity as a factor, despite, unusually for a Frenchman, being familiar with some of the Anglo-American literature on the topic, notably The Bell Curve. Todd’s objective role, his ideological niche, is then to advocate a civic nationalism willfully ignorant of ethnic realities. He laments that France, locked in the Eurozone, suffers from economic stagnation and German hegemony (he has admitted to being a “Germanophobe”). He would much rather France be able to be a rough-and-tumble Keynesian bubble economy like the United States and Great Britain, free to consume without end and be steadily dissolved in a chaotic multi-ethnic soup. Todd: [The TV show Supernanny] speaks to me. Because the [lead] girl is Jewish, Jewish-American and the guy is English. And as I come from a Jewish-British family I have reasons to laugh. . . .
Interviewer: You recently realized you are Jewish? Todd: [Hesitates.] I think I have the identity of a Maranno. . . . In the established view, the Maranno is a Jew who is converted by force [to Christianity] but who secretly remains Jewish. The concept didn’t interest me very much and then . . . reading a story of the Venice ghetto I fell upon the trial of a Maranno and I understood what it really meant to be a Maranno. People asked if he was Jewish, Christian, etcetera. During the interrogations, you realize that a Maranno is actually someone who doesn’t know who he is anymore. Indeed, he is not a good Christian, but in fact he doesn’t know anymore if he is Jewish or not. That speaks to me, that speaks to me! . . . In some situations, it’s always the same, I’m extremely proud to be of Jewish origin. . . . I’m also very happy to have a grandmother of English origin. . . . I’m super happy to be of Breton origin. If we are in a France which is rediscovering racism under the cover of Islamophobia and anti-Semitism, etcetera, it is obvious that the Jewish identity is going to become massively preeminent in the current context, massively. So there you have it! Todd’s objectively anti-European position, according to him, is ethnically motivated by his Maranno identity as a crypto-Jew and confused, rootless métis (a mixed-race person). And, he implies, the more divided France is racially and religiously, the more he will identify as a Jew and oppose the interests of the native French. Needless to say, Todd’s particular ideological niche — pro-immigration and ethnos-denying civic nationalism — is eminently compatible with Jewish and globalist interests and is entirely in line with the priorities of organized Jewish communities throughout the West. All this would also explain Todd’s bizarre position on the Charlie Hebdo affair. 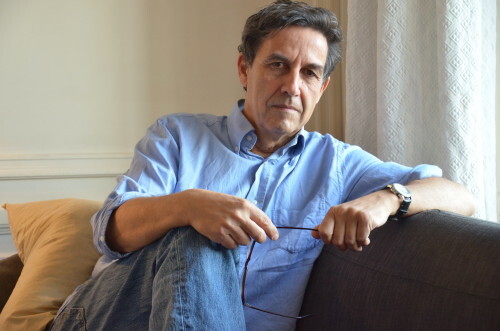 He blames the government’s authoritarian reaction — with orchestrated mass demonstrations, intensified government spying on citizens, and state-sanctioned Islamophobia with government subsidies for the satirical newspaper Charlie Hebdo to insult Islam (and the Front National) — on what he calls “Zombie Catholicism.” Todd alleges that this recent authoritarianism and Islamophobia of the French state is driven by the latent authoritarian mentality of traditionally Catholic regions of France. We have to consider this “Zombie Catholicism” concept to basically be spurious squid ink. There are many factors at work in the government’s hypocritical reaction to the Charlie Hebdo affair — in effect condoning Islamophobic blasphemy in the name of “free speech” while continuing to formally censor and prosecute critics of Jewish-Zionist power and those who would not bow to the Shoah as world-religion (Jean-Marie Le Pen, Robert Faurisson, Dieudonné M’bala M’bala, Alain Soral . . .). In short, the French Jewish community, besides a few dissenters, agrees the Shoah should continue to be sacralized; however, there are differences on Islam. The community is pushing in two different directions: Firstly, the traditionally-dominant liberal Jewish wing wants to stick to the agenda of displacement-level Afro-Muslim immigration and coercive (i.e., authoritarian) multiculturalism; secondly, the emerging neoconservative Jewish wing wishes to crack down on Islam and destroy all Muslim nations opposing Israel (yesterday Iraq and Libya, today Syria, tomorrow Iran?). Alain Soral argues these two tendencies are not contradictory and, on the contrary, prophesizes that this combination of continued mass Muslim immigration and state-sanctioned Islamophobia will eventually lead to a great ethno-religious civil war which will destroy France forever . . . Vengeance for Anne Frank, you might say, for so many of those in the community whose hearts are filled with eternal and bottomless hatred for the evil European goyim. By the way, Todd’s bizarre explanation for the French government’s hypocritically Judeocentric and Islamophobic reaction to the Charlie Hebdo affair resonated with one Glenn Greenwald, who praised Todd as a “philosopher” . . . The rise of anti-Semitism pushed me to write Who Is Charlie? [his book on the affair]. I am of Jewish origin. I come from an assimilated Jewish family. I never thought it would be possible to see a return of any anti-Semitism in France. After the killing of the Hyper Cacher, I ended up accepting, even though I had still been resisting after the killings [of Jews by Muslims] in Toulouse and Brussels, I finished by recognizing the return of a problem of anti-Semitism. The development of any religious or anti-religious passion will lead to the development of all anti-religious passions. Any growth in Islamophobia will lead to more anti-Semitism. Bizarrely, Todd is thus concerned about European anti-Semitism in response to Muslim killings of Jews. This is apparently crazy, but there is a certain logic: Todd is unconcerned with the occasional flailing violence of Muslim anti-Semitism and is far more afraid that the return of organized French nationalism in response to Islamization could ultimately lead to anti-Semitism. In contrast, a certain kosher French nationalism is receiving support from Jewish “neoreactionaries” such as Éric Zemmour and Alain Finkielkraut, the latter even defending the free expression of White advocacy. Personally, I do believe that any unearned Jewish privilege would not survive the return of genuine nationalism across the European world. Anyway, I dare say that the sources of Todd’s obtuse positions and apparently contradictory arguments are now clear. Yes, his promotion of death-instinct among the old French is perfectly coherent. Todd asserts: “we hegemons” will disappear, ending racism forever. To paraphrase: “We will just have to die off, goyim, and it will be wonderful, ending your horrible racism!” But who is “we”? Jewish gene pools in the form of Israel and Hassidic Jews continue to maintain their purity and have relatively high birth rates, certainly higher than the European world. A few in both these communities defect, generally marrying into non-Jewish elites, but they retain a Jewish identity which, in Todd’s words, “is going to become massively preeminent” in any “anti-Semitic” context. Todd’s Jewish identity, the “preeminent” one, is perfectly secure in this world in which all European nations are becoming Balkanized and people of European descent are set to become vulnerable minorities. Todd is the grandson of the rabbi of Bordeaux. It would seem he has inherited the penchant for what Raymond Aron called “Talmudic ratiocinations.” That is fine within their Jewish world. Let them tell each other as many narcissistic fairy tales as they wish. But advocating the destruction of our nations through deceitful arguments and promotion of the death-instinct in our world? That indeed has always ended badly, often for us, always for them.